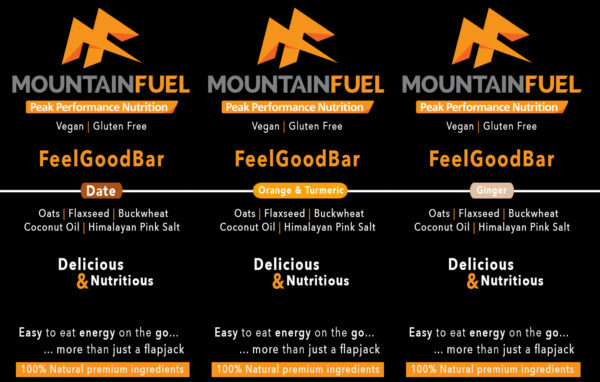 With the gluten free and vegan Mountain Fuel FeelGoodBars, we’ve put together a perfect blend of 100% natural ingredients to produce a bar that is easy on the stomach; the ‘Go-To Energy Bar For Every Endurance Athlete’. You can ‘EAT’ this bar on the go… how may bars have you tried to eat on the go and simply can’t get them down?! Typically, flapjacks and bars contain butter or golden syrup as a base… we don’t as these ingredients aren’t the healthiest nor do they make for easy eating on the go as they clag up in your mouth. 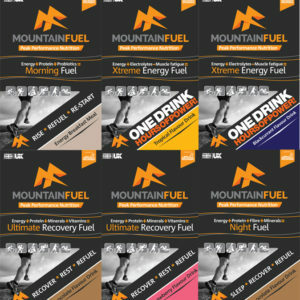 We use a premium blend of functional, not ‘faddy’ ingredients that deliver results. Each bar contains a blend of ingredients that complement one another and also include a blend of simple and complex carbohydrate, omega 3 essential fatty acids, anti-oxidants, micronutrients, vitamins, and complete protein. 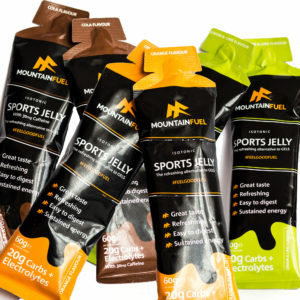 You need more than just energy from your foods, during exercise you need to consume foods that are easily absorbed in the stomach, can replenish your muscles, aid digestion, reduce inflammation and spare your carbohydrate by aiding fat oxidation meaning that you can go harder for longer.